Enter an address to use as the destination. The state or province you are currently in is displayed (e.g., California). 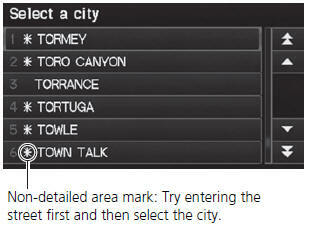 • City: Selects your destination city. • Street: Selects your destination street. 1. Enter a state name.  Select List to display a list of states. 2. Select a state from the list. The name of the city where you are currently located is displayed. 1. Enter the name of a different city, or select List for the current city. ► Select List to display a list of cities. 2. Select your destination city from the list. ► A list of matching hits is automatically displayed after you enter several letters, with the closest match at the top of the list. ► Next, you are prompted to enter a street name. • The automobile is traveling off-road. • The vehicle position data cannot be updated. your current location, or say the name of a different city. If your city is not listed, it may be part of a larger metropolitan area. Try entering the street first. 1. Enter the name of your destination street. ► Do not enter the street type (e.g., street, road, avenue) or direction (e.g., north, south, east, west). ► Select List to display a list of streets. 2. Select your destination street from the list. When entering the names of major freeways, you can use the following abbreviations. For interstates, use an “I” (e.g., I-10). For U.S.
freeways, use “US” (e.g., US-18). For state freeways, use the two-character state designation (e.g., CA-101). For county roads, use the appropriate designation (e.g., G-2). • Say the name of your destination street, and say the street number as a string of individual numbers. • Set the route to your destination. 3. Enter the street number. Select OK.
► Only valid street numbers can be entered. If you did not select a city first and there is more than one city with the specified street, a list of cities is displayed. Select the desired city from the list.